GENEVA – A raft of reforms under way in Uzbekistan must invest in the promotion and protection of human rights, including freedom of religion or belief, a UN expert has concluded at the end of an official visit to the country. "Religions or beliefs should not be seen as a threat to Uzbekistan, where many ethnic and religious communities live together peacefully," said the Special Rapporteur on freedom of religion or belief, Ahmed Shaheed in a statement at the end of his 11-day visit. "Resilience against religious extremism can be built on strengthening diversity as well as freedom of religion or belief." The Uzbekistan government should invest more in freedom of religion or belief in its ongoing reforms, to bring existing regulations more into line with international standards, he said. "The rights to freedom of religion or belief cannot be sacrificed in preventing or countering violent extremism," the Special Rapporteur cautioned. "This will further shrink rather than open up space as hoped for in the current reforms." Shaheed said the recent reform efforts by the country's president could be a turning point in Uzbekistan's development, if they are implemented systematically. But he noted that the country faced numerous human rights challenges, and would require sustained and transparent commitment to make enjoyment of the right to freedom of religion or belief a reality. "Freedom of religion or belief requires widening the space for the freedom of association, peaceful assembly and expression, as well as strengthening the rule of law and guaranteeing the independence of the judiciary," said Shaheed. Uzbekistan is at the intersection of the great trade routes such as the Old Silk Road along which merchants and discoverers, geographers and missionaries, invaders and conquerors crossed on go east or west. It is famed for its magnificent Islamic architecture and stunning natural beauty. "While Uzbekistan is a secular State, freedom of conscience, thought, religion or belief is over-regulated, if not restricted, in the country. Religious communities can only function within the given limits of registration and the authorities tend to stay watchful of all religious activities." The Special Rapporteur noted, "The tradition of harmonious co-existence among diverse communities in Uzbekistan provides fertile ground for encouraging inter-religious communication and societal flourishing through the expression of the self-identity of every individual." "People should not have to activate auto self-censorship whenever they speak of religion or practice their faiths." Shaheed said he had seen good initiatives in youth education, especially in increasing religious literacy. "Literacy on freedom of religion is just as important and needs to be promoted simultaneously," he noted. During his mission, Shaheed met government officials and local authorities in Tashkent, Fergana, Bukhara, Nukus and Jaslyk Prison. He also held meetings with representatives of ethnic and religious or belief communities, civil society organizations, the diplomatic community and the UN. Separately, the U.S. Commission on International Religious Freedom (USCIRF) says in the Uzbekistan 2017 International Religious Freedom Report, that with an estimated 13,500 religious and political prisoners, the government of Uzbekistan continues to perpetrate severe violations of religious freedom. It says that in April 2016, the sections of the criminal and administrative codes used to restrict freedom of religion or belief were amended to increase penalties for various infractions. The Uzbek government continues to imprison hundreds of Muslims who do not conform to officially prescribed religious practices or whom it claims are extremist. It noted that the suspicion of terrorism was used to justify persecution of Uzbek labor migrants and their families, while Kazakh and Russian citizens were arrested at the border for possessing religious materials. "Members of Protestant denominations were subjected to frequent harassment through raids on private homes, seizures of religious literature, and the levying of fines," the report said. Based on these systematic, egregious, ongoing violations, USCIRF again finds in 2017 that Uzbekistan merits designation as a "country of particular concern," or CPC, under the 1998 International Religious Freedom Act. While the U.S. State Department has designated Uzbekistan as a CPC since 2006, most recently in October 2016, it has indefinitely waived taking any action due to the designation. With an estimated 28.7 million people, Uzbekistan is the most populous post-Soviet Central Asian State. An estimated 93 percent of its population is Muslim, most of who follow the Hanafi school of Sunni Islam, with about 1 percent Shi'a, mostly in Bukhara and Samarkand. 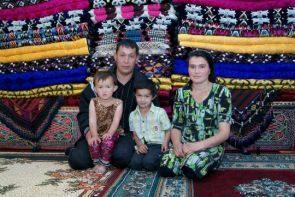 About four percent of the Uzbekistan population are Russian Orthodox, while another three percent include Roman Catholics, ethnic Korean Christians, Baptists, Lutherans, Adventists, Pentecostals, Jehovah's Witnesses, Buddhists, Baha'is, Hare Krishnas, and atheists. About 6,000 Ashkenazi and 2,000 Bukharan Jews live in Tashkent and other cities. Uzbekistan's 1998 Law on Freedom of Conscience and Religious Organizations severely limits the rights of all religious groups and facilitates government control of religious activity, particularly of the majority-Muslim community, says USCIRF.